The EcoHitch® Invisi hitch for the 2012-2016 Subaru Impreza Sedan is designed to be completely concealed and hidden behind the license plate so you don't have to see an unsightly crosstube underneath your vehicle. 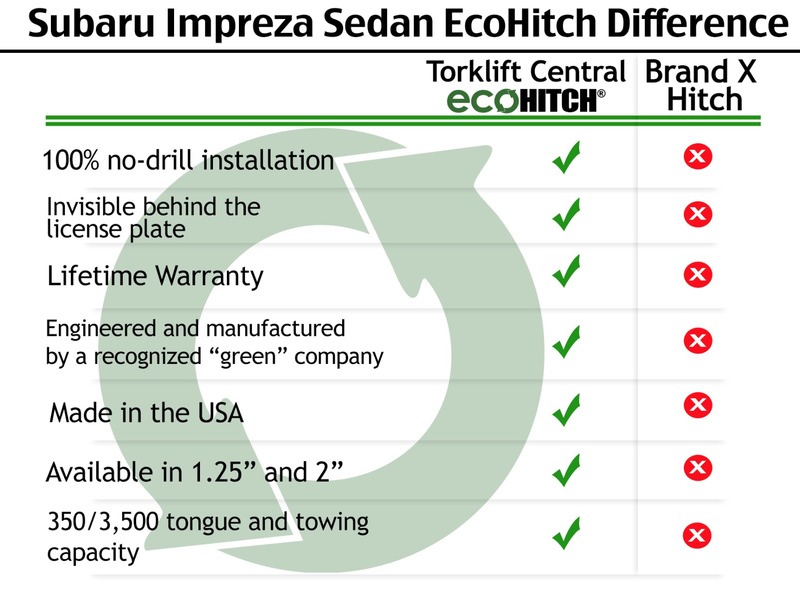 Rated for 350 pounds tongue weight and 3,500 pounds towing weight, the EcoHitch is full of personality that complements your Impreza and can help you bring extra cargo, your bikes and more. *If you’re going to be towing and need trailer wiring, click here! Ensure your wiring harness does not drag on the ground by visiting our Eclipse trailer wiring bracket page. *If you’re going to be towing and need trailer wiring, click here! Giving you all the creature comforts to love every day’s journey, your Subaru Impreza needs a trailer hitch that will be able to keep up with your needs. With this hitch for Subaru Impreza, we have made a perfect complement to your fuel-efficient Impreza Sedan. The Invisi® hitch for the Subaru Impreza gives you the option of having the receiver behind the knockout panel – making it so the hitch is always hidden unless it’s being used. You get the most amount of clearance possible with this hitch by being located behind the Impreza’s knockout panel. This Subaru trailer hitch gives allows you to have an amazing ride in your Impreza without conceding cargo space or style. With 350 pounds tongue weight and 3,500 pounds towing weight capacity you won’t have to leave anything behind and will have plenty choices of which bike racks and cargo trays to use with this hitch for Subaru Impreza. Hitch fits all 2012+ Subaru Impreza Sedan's with hidden knock out panel. Hitch will be invisible to the eye and the receiver will rest behind the knockout panel. Factory knockout panel is designed to be replaced when not in use giving the hitch the "invisi" look. *WARNING* Your vehicle may have a lower tow rating than this trailer hitch. If your vehicle's tow rating is less than the rated towing capacity on your Torklift Central trailer hitch, your trailer hitch capacity is limited to your vehicle's factory rated towing capacity. *This video is intended to give a general overview of how this hitch is installed. For more specific information or details, please refer to the written instructions. You can request instructions here on our website.